Can Corporate Rate Reduction Save the Tax Agenda? The good news is that the House put together an Obamacare-repeal bill that reduced the fiscal burden of government. The bad news is that the legislation didn’t address the regulations and interventions that produce rising costs and sectoral inefficiency because of the third-party payer problem. Whether the bill was a net plus is now moot since it didn’t have enough votes for approval. And the withdrawal of the legislation has generated a bunch of stories on whether Trump and congressional Republicans are incapable of governing. In particular since it appears that GOPers also seem incapable of coming to agreement on how to reduce the tax burden. I commented on the dysfunctional state of affairs in this interview with Neil Cavuto. The bottom line is that there are big divisions. There is (thankfully) a lot of opposition to the border-adjustable tax, and there’s also no agreement on whether the tax plan should be a pure tax cut or whether it should be a revenue-neutral package that finances lower tax rates by eliminating or curtailing undesirable preferences. Jason Furman, who was the Chairman of Obama’s Council of Economic Advisers, suggest that Republican divisions won’t matter if tax reform becomes a bipartisan issue. But I’m not overly impressed by the five conditions he outlines in a column in today’s Wall Street Journal. “Commit to revenue neutrality and distributional neutrality, as in the 1986 tax reform” – This is a poison pill, mostly because “distributional neutrality” means lawmakers would be constrained by class warfare concerns instead of focusing on how to produce growth. Indeed, this is why the plan put forth by the previous Chairman of the Ways & Means Committee was such a dud. “Focus on business taxes only” – As I mentioned in the interview, I actually think this suggestion makes sense. “For overseas business income, adopt something like a ‘minimum tax. '” – This is another poison pill. It’s designed to preserve worldwide taxation. Moreover, I explained last year that such schemes discriminate against nations with better tax policy. “For domestic business income, adopt something along the lines of the House Republican proposal” – There’s not a lot of detail in the WSJ column, so it’s unclear if Furman is endorsing the notorious BAT from the House plan. He does explicitly endorse expensing over depreciation and he wants to put debt and equity on a level playing field. If that’s all he means, I agree with him. “Incorporate into the bill a real plan for public infrastructure spending” – Since the federal government should not have any role in transportation, I’m obviously not enthusiastic about this proposal. Though if a bit of pork was the price to get an otherwise good bill through the process, I wouldn’t object too strenuously. It’s unclear if Furman considers the five conditions a package deal. If so, there is zero chance of bipartisanship because Republicans presumably will not agree if they are bound by distributional neutrality. But if a “business taxes only” agenda can get some Democrats on board, then there may be hope. Especially since that may make a virtue out of necessity, as I suggested in the interview. And for those who question whether lowering the corporate tax rate is important, here’s an argument-ending chart from a recent Tax Foundation publication. Keep in mind that the U.S. corporate rate (including state levies) is 39 percent. 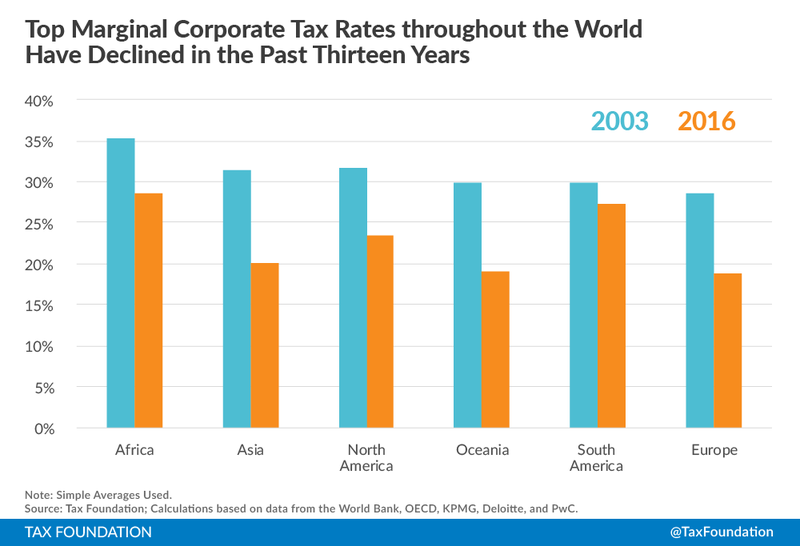 It’s particularly noteworthy that average corporate tax rates in Europe and Asia are about 20 percent, far lower than the tax burden imposed on companies in the United States. No wonder many American companies have redomiciled to other nations. The ultimate answer is to junk the entire tax code and adopt a simple and fair flat tax. The best-possible answer we may get out of dysfunctional Washington is probably a lower corporate rate. I know this wasn’t the point of this piece, but if the federal government “should not have any role in transportation,” should we not have an interstate highway system?